Last night, Marco Rubio went on Fox News to try to fear-monger over the phone dragnet again. He repeated the claim that the AP also idiotically parroted uncritically — that the government can only get three years of records for the culprits in the San Bernardino attack. In the case of these individuals that conducted this attack, we cannot see any phone records for the first three years in which — you can only see them up to three years. You’ll not be able to see the full five-year picture. Again, he’s ignoring the AT&T backbone records that cover virtually all of Syed Rizwan Farook’s 28-year life that are available, that 215 phone dragnet could never have covered Tashfeen Malik’s time in Pakistan and Saudi Arabia, and that EO 12333 collection not only would cover Malik’s time before she came to the US, but would also include Farook’s international calls going back well over 5 years. So he’s either an idiot or he’s lying on that point. I’m more interested in what he said before that, because he appears to have leaked a classified detail about the ongoing USA Freedom dragnet: that they’ve been issuing orders to a “large and significant number of companies” under the new dragnet. There are large and significant number of companies that either said, we are not going to collect records at all, we’re not going to have any records if you come asking for them, or we’re only going to keep them on average of 18 months. When the intelligence community or law enforcement comes knocking and subpoenas those records, in many cases there won’t be any records because some of these companies already said they’re not going to hold these records. And the result is that we will not be able in many cases to put together the full puzzle, the full picture of some of these individuals. Let me clear: I’m certain this fact, that the IC has been asking for records from “a large number of companies,” is classified. For a guy trying to run for President as an uber-hawk, leaking such details (especially in appearance where he calls cleared people who leak like Edward Snowden “traitors”) ought to be entirely disqualifying. But that detail is not news to emptywheel readers. As I noted in my analysis of the Intelligence Authorization the House just passed, James Clapper would be required to do a report 30 days after the authorization passes telling Congress which “telecoms” aren’t holding your call records for 18 months. This adds language doing what some versions of USA Freedom tried to requiring DNI to report on which “electronic communications service providers” aren’t hoarding your call records for at least 18 months. He will have to do a report after 30 days listing all that don’t (bizarrely, the bill doesn’t specify what size company this covers, which given the extent of ECSPs in this country could be daunting), and also report to Congress within 15 days if any of them stop hoarding your records. 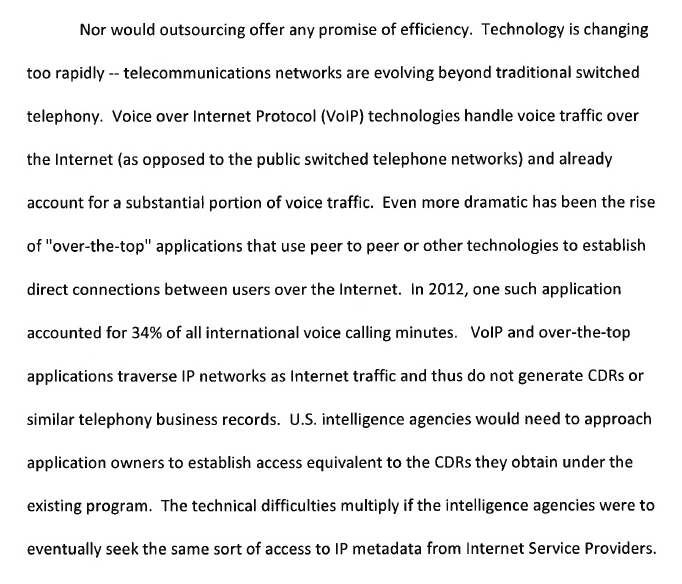 At the same time, I thought that the report’s usage of “phone company” might limit collection to the providers that had been included — AT&T, Verizon, and Sprint — plus whatever providers cell companies aren’t already using their backbone, as well as the big tech companies that by dint of being handset manufacturers, that is, “phone” companies, could be obligated to turn over messaging records — things like iMessage and Skype metadata. Nope. According to uber-hawk who believes leakers are traitors Marco Rubio, a “large number” of companies are getting requests. Woods describes Skype (as the application that carried 34% of international minutes in 2012), as well as applications like iMessage and smaller outlets of particular interest like Signal as well as conferencing apps. So it appears the intelligence committees, because they’re morons who don’t understand technology (and ignored Woods) got themselves in a pickle, because they didn’t realize that if you want full coverage from all “phone” communication, you’re going to have to go well beyond even AT&T, Verizon, Sprint, Apple, Microsoft, and Google (all of which have compliance departments and the infrastructure to keep such records). They are going to try to obtain all the call records, from every little provider, whether or not they actually have the means with which to keep and comply with such requests. Some — Signal might be among them — simply aren’t going to keep records, which is what Rubio is complaining about. That’s a daunting task — and I can see why Rubio, if he believes that’s what needs to happen, is flustered by it. But, of course, it has nothing to do with the end of the old gap-filled dragnet. Indeed, that daunting problem arises because the new program aspires to be more comprehensive. In any case, I’m grateful Rubio has done us the favor of laying out precisely what gaps the IC is currently trying to fill, but hawks like Rubio will likely call him a traitor for doing so. https://www.emptywheel.net/wp-content/uploads/2016/07/Logo-Web.png 0 0 emptywheel https://www.emptywheel.net/wp-content/uploads/2016/07/Logo-Web.png emptywheel2015-12-08 02:09:402015-12-08 07:42:13Marco Rubio Leaks that the Phone Dragnet Has Expanded to "A Large Number of Companies"
The NatSec twittersphere is abuzz about the fact that the CIA indirectly warned Hezbollah that some al Qaeda operatives were preparing an attack on a location in southern Lebanon. I’m actually less interested that we felt the need to warn a political entity that we consider a terrorist organization than the other details of the story — and that it is a story Lebanese sources felt free to share with the press. “They had transcripts of calls made from known al Qaida people in Lebanon to people in the Gulf that included detailed information about the attacks, including the amounts of explosives that had been smuggled into Lebanon,” said one Lebanese intelligence official who is barred from speaking openly to reporters. McClatchy suggests these al Qaeda figures were calling other al Qaeda figures in this unnamed Gulf country. But why should we assume that? Qatar has been funding al Qaeda linked militants in Syria. Is it possible this story is public because the US wants it known that we’re so tired of Qatar’s support for terrorists we’ll even tip Hezbollah to plans Qatari backed terrorists have made? Indeed, a comment from a Hezbollah member quoted in the story seems to suggest this warning (and, I would suggest, the publicity surrounding it) is an effort to put the genie we’ve created back in the bottle. That monster was created with the funding of one of our close allies. I’m also intrigued by the suggestion that the US managed to collect these calls whereas the Lebanese could not because it was VOIP. 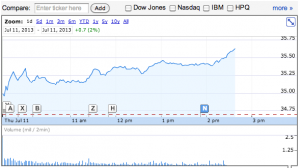 We’ve just learned the extent to which Microsoft has helped the government access Skype. And the government claims such disclosures have led terrorists to stop using Skype. Were these terrorists and their friends in the gulf? Update: Via Twitter, McClatchy reporter and Middle East expert Jonathan Landay says I’m reading way too much into this, and that there is a backstory he cannot share. So take these musings as off-base ones. The Guardian has its latest scoop on NSA spying, describing the extent to which Microsoft helps the government spy on its customers. This bullet list is just some of what the article reveals. But I’m as interested in some of the details about the cooperation as the impact of that cooperation. For example, the story describes that this cooperation takes place through the Special Source Operations unit. But we saw that when NSA approached (presumably) Microsoft in 2002, it did not approach via SSO; it used a more formal approach through counsel. In addition, note how Skype increased cooperation in the months before Microsoft purchased it for what was then considered a hugely inflated price, and what is now being called (in other legal jurisdictions) so dominant that it doesn’t have to cooperate with others. While this isn’t as obvious as Verizon’s MCI purchase — which for the first time led that carrier to hand over Internet data — it does seem that those companies that cooperate with the NSA end up taking over their rivals. Remember, the Department of Commerce plays some kind of role in ensuring that companies cooperate in protecting our critical infrastructure. 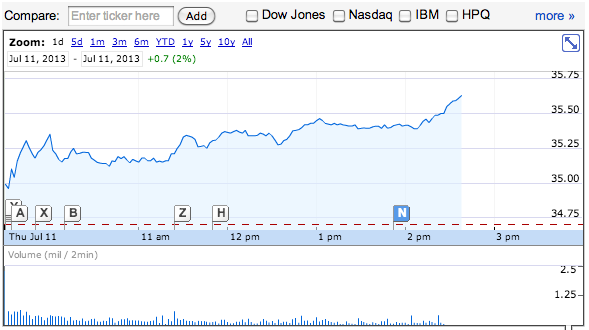 As of 2:30, Microsoft stock is at a high on the day. — Timing of NSA’s access to communications/software/social media firms occurred alongside major cyber assault events, particularly the release of Stuxnet, Flame, and Duqu. Let’s compare timelines; keep in mind these are not complete. Adobe applications suffer from 6+ challenges throughout the year, including attacks on Tibetan Government in Exile via Adobe products. Operation Aurora attacks begin; dozens of large corporations confirming they were targets. Again, this is not everything that could be added about Stuxnet, Flame, and Duqu, nor is it everything related to the NSA’s communications collection processes. Feel free to share in comments any observations or additional data points that might be of interest. Please also note the two deaths in 2010; Stuxnet and its sibling applications were not the only efforts made to halt nuclear proliferation in Iran. These two events cast a different light on the surrounding cyber attacks. Why aren’t any large corporations making a substantive case to their customers that they are offended by the NSA’s breach of their private communications through their communications providers?